Chefs host "Make Food Not Waste: Community Feast"
Over 800 million people around the world go hungry every day, while 40 percent of the food we grow and buy here in the U.S., gets thrown in the trash. 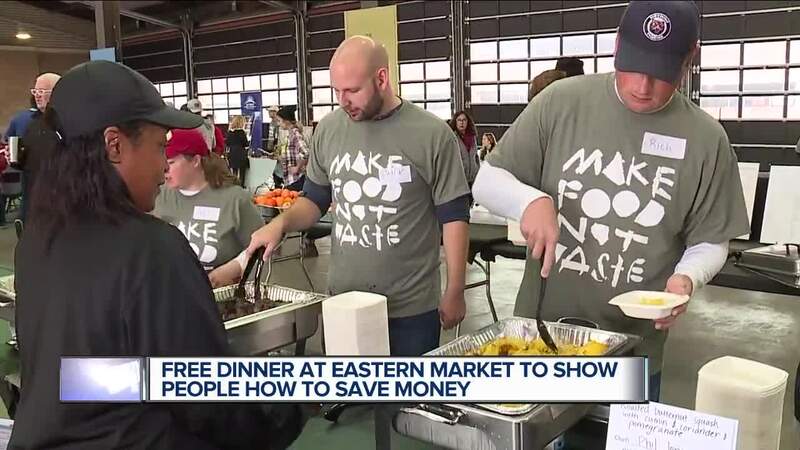 To help inspire change, metro Detroit chefs gathered items that would have gone to waste and used it to put on a free dinner in Eastern Market's Shed 5 as part of the “Make Food Not Waste: Community Feast” event. "We’re trying to empower our community," says Chef Phil Jones with Ruth’s Catering Company located in Detroit's Hannan Center. He helped organize the event and is one of many Detroit chef's who donated his time to whip up tasty dishes using items that likely would have ended up in the trash. For example, a box of butternut squash with skin covered in spots wouldn't have sold at a grocery store, but the squash itself was just fine and it made really yummy side dishes. Jones says it's important to read food labels carefully. "There’s a 'best by' and a 'use by' date so, when it passes the 'best by' date, it’s still good usable food," Jones said. Food waste costs the average family about $2,000 dollars every year according to the "Make Food Not Waste" event organizers and they hope the free community dinner shows people easy ways to save money by using all the food in the fridge. "We can actually use things in its entirety, things you don’t normally think of as food," Jones said. For example, stir-fried banana peel. You read that right – stir-fried banana peel. "Yes! It’s delicious," Jones said. Most of us Americans throw banana peels away without a thought, but they are a culinary staple in places like India and the Caribbean. They are also packed with anti-oxidants, fiber and apparently very delicious in a stir-fry. For Cecelia Ramirez, squash soup was an adventure. She tried it today for the first time. "The soup is super delicious! I never had it before, so it’s really interesting," Ramirez said. "And it seems really easy, they show the list of ingredients and I thought maybe I can do this at home," Ramirez said. Throughout the event, experts were on hand speaking about the various ways to reduce food waste and the impact – both on our wallet and on the environment. Many offered very practical tips. "There are a lot of ways we can help ourselves and they are relatively simple," Jones said. "Meal prep, save and store, or share with your family and friends ... it can really make such a huge difference," Ramirez said. Another tip: Shop at home first. Make a grocery list before you go shopping, not of what you want to buy but an inventory of the food you already have. This way you don't forget about items that may have gotten pushed to the back of the fridge. You can avoid buying double and make sure you use food before it goes bad. More tips and recipes to help you reduce food waste can be found at www.makefoodnotwaste.com .